The story began when a young concrete inspector learned valuable insights of what construction is all about-the planning, preparation, implementation, and the systems involved and put up his own contracting company bearing his name, DAVID CONSUNJI Civil Engineers and Contractors. Equipped with a vision, dedication to profession and a degree in Civil Engineering from University of the Philippines, this young inspector in a small room in Pandacan, Manila, DAVID MENDOZA CONSUNJI (DMC) founded D.M.Consunji, Incorporated (DMCI) on December 24, 1954. Starting from constructing chicken houses for the Bureau of Animal Industry, DMCI has earned a reputation for on schedule delivery and quality work. Since major projects such as the Tacloban Coca Cola Plant and Bacnotan Cement Plant were awarded. With more than five decades of solid track record in the construction business, DMCI enjoyed the continued patronage of institutional clients such as the Ayala Group, SM Group, Kuok Group, Robinson’s Group, San Miguel Corporation; banking institutions such as the Citibank, N.A., BPI, Equitable and Urban Bank; educational institutions such as the University of the Philippines, and De La Salle University; multinationals such as the John Laing, Obayashi, Mitsubishi Heavy, Oriken, Nippon Steel. Also, industrial companies and some government agencies had sought the services of DMCI and still are using the company’s services. 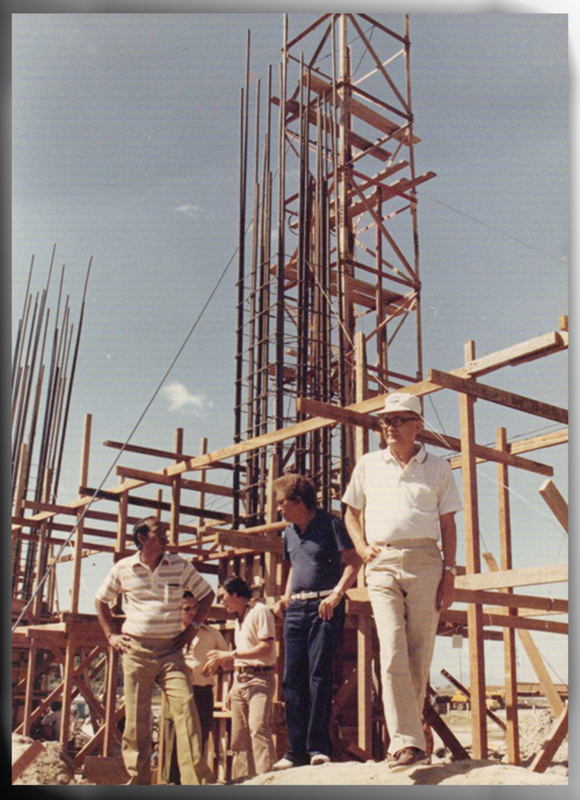 DMCI during the 70’s and 80’s was also actively engaged in overseas construction projects. Several of these projects were the New Istana (Royal Palace) of the Sultanate of Brunei, the Salim-Halban Highway, and several ARAMCO facilities in Saudi Arabia, bridges in Kuwait, irrigation projects in Iraq and many others. With its expertise, DMCI has constructed the largest numbers of high-rise and commercial buildings in the Philippines, especially in the Makati and Ortigas centers, two of the country’s premier financial districts. High-rise and commercial building construction is DMCI’s stronghold where it has extensive portfolio. For the Ayala Corporation: the Ayala Triangle Tower I, the Philippine Stock Exchange Plaza and Roxas Triangle. For major Banking Headquarters: the Fareast Bank (now part of BPI), Citibank, Urban Bank, Equitable Bank (now Banco de Oro-EquitablePCI), BPI and UCPB bank. Five Star Hotels: the Shangri-La Mactan Island Resort and Shangri-La Hotel in Makati, the Westin Philippine Plaza, the Manila Hotel and the Hyatt Hotel. For Big Commercial Malls: the SM Megamall, SM Dasmarinas, SM Manila, SM Bacoor and SM Fairview. And for high-end condominiums, the Rockwell Center’s Five Condominium Towers, the country’s single largest high-rise project to date. In infrastructure, its portfolio includes fast-track projects such as the Carmen Bridge, the one-kilometer Magat Bridge, the Gibong Diversion Dam, the Narvacan Power Transmission Lines, the three interchanges on Manila’s main thoroughfare and recently, the Trackworks on LRT-2 and Chiquita Unifrutti Wharf and Cold Storage Plant. In the industrial sector, notable of these are; Five Semiconductors Facilities namely, Intel, NEC, Analog Device, Motorola and Philips; Enron Power Plant in Subic and Pinamucan, Batangas and recently the Panay Power Plant and Dingle Power in Iloilo. Foreign governments and corporations have likewise tapped DMCI for large-scale projects such as the US Navy hangar in Subic. In addition, DMCI has constructed or has served as a significant contractor in a number of projects abroad. Among these are the construction of: the New Istana (The Royal Palace) in the Sultanate of Brunei; numerous bridges along the Zalim-Halban Highway in the Kingdom of Saudi Arabia; interchanges and bridges along the King Faisal Motorway in the State of Kuwait; and huge irrigation structure in the Kirkuk-Adhaim Irrigation Project in Iraq. As a result of its excellence in contracting, DMCI has received a number of awards. In 1992, DMCI was named “Outstanding Contractor in Building” at the inaugural Philippine Construction Industry Awards. In addition, DMCI has received a certificate of appreciation from the U.S. Department of Navy and Safety Awards from Fluor Daniels Corporation for two million accident-free man-hours at the Shell Petroleum Corporation’s STAR project. On March 8, 1995, DMCI Holdings, Inc. (DMCI HI) was incorporated. As a holding company it will consolidate all construction businesses, construction component companies and subsidiaries and affiliates. It was listed on the Philippine Stock Exchange on December 18, 1995. Chairman David M. Consunji was cited as the one of the four awardees of The Outstanding Filipino (TOFIL) of 2002, Papal awardee of Knighthood of Saint Sylvester in 1988, Doctor of Laws, Honoris Causa by the University of the Philippines in 1988, Meralco Awardee in Engineering and Applied Science in 1994, Management Man of the Year Awardee in 1996 and the UPAA Lifetime Distinguished Achievement Awardee for the 2005, for his invaluable contribution to the development and progress of the country. The hundreds of landmark infrastructure constructed by DMCI symbolize the expertise and professionalism of the Filipino engineer.